Threshold Design employs every green tool in the book in making eco-friendly countertops in Ottawa. Owner John Farley uses local materials for all of his aggregate and cement products – replacing as much as 25% of the cement content with ingredients obtained from industrial by-products near Ottawa. Concrete kitchen countertops are in good environmental taste and can add LEED credits to your job. Just ask us how!! 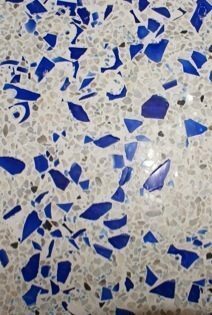 Another way that we have made a ‘Greener’ product is by using post consumer recycled glass and making sure that 87% of what goes into our concrete is recycled content. Aggregates are quarried within 50 kms of our shop. Glass which is processed at the shop comes from a local glass recycling yard. The cement that binds is all together is manufactured right here in Ontario. All this makes for a very GREEN product. We also stay green by collecting and filtering our waste water so that it can be recycled back into the process and used in the concrete mix. Very little is wasted in our shop!! We use several high grade sealers that have NO Volatile Organic Compounds (VOC) to make the counters more Eco-friendly. You will have a choice between Topical and Reactive sealers for your project. Each gives a distinct look and feel. The choice of sealer will be determined based on client needs and considerations. Also, we use nontoxic, water-soluble form release agents, which are biodegradable and help to keep your countertops healthy and food friendly. Casting techniques and designs undergo a continuous improvement process which focus on LEEDS compliance (Leadership in Energy and Environmental Design) which is based on a points rating system created by the US and Canadian Green Building Councils. Our concrete can help Architects and Builders on a project attain LEED credits. Just ask us how we can add up to 6 points to your project! !